Quit the winein’ and cheese it up! Cheese and beer are a match made in heaven, and Serious Eats isn’t just confirming it, they’re offering up thoughtful pairings that work together. Read on for their recommendations—you never know the right beer with the right cheese may make you like a beer you never thought you’d enjoy or a cheese you never thought you could handle… now can you handle that? Uh, in stark contrast to my last Press Pint… some recent failed fit-ness shed light on my lack of “successful” physical activity of late (a few too many 12-oz curls, har har… but, really.) I’ve always been pretty active and have never been a fan of dieting. But I do let my busy schedule get in the way of “actual” how-you-say “exercise” …and eventually the results become more noticeable (ie too much huff-puff up a hill… a steep one, but still, not like the good ol’ days). Anyway, my point: it IS possible to stay healthy and keep enjoying good beer, you just have to do it to it, and it doesn’t hurt to throw a few veggies in every now and then, right? … sobering? Maybe, but it’s nice to get outside. Beer and food go together like… beer and food (or peas and carrots, whatever). And lesser-known, though growing in popularity, is the practice of pairing beer with food the way we do wine… beer is perfect in that its natural acidity helps the mouth balance the flavors of the food. But what if you had beer and food…. combined (oh, and FRIED, yeah.)? Sounds pretty good to me, as long as there isn’t that “pizza-bites effect” where the inside bursts out and scalds your mouth, ruining eating for the next week. ouch. The beer is placed inside a pocket of salty, pretzel-like dough and then dunked in oil at 375 degrees for about 20 seconds, a short enough time for the confection to remain alcoholic. August 27th is a pretty important day! Like I wrote in my inaugural post about Yuengling, I think the mentality of a brewer says a ton about the brewery’s status as “craft brewer.” Yuengling‘s still got it and so does Sam Adams. Any great brewery that helps the world realize the promise of microbreweries is a good thing for this industry–so I guess this is growing up. In a world where Nabisco sells “artisan” Wheat Thins, the designation of Samuel Adams as a craft beer seems perfectly fair. 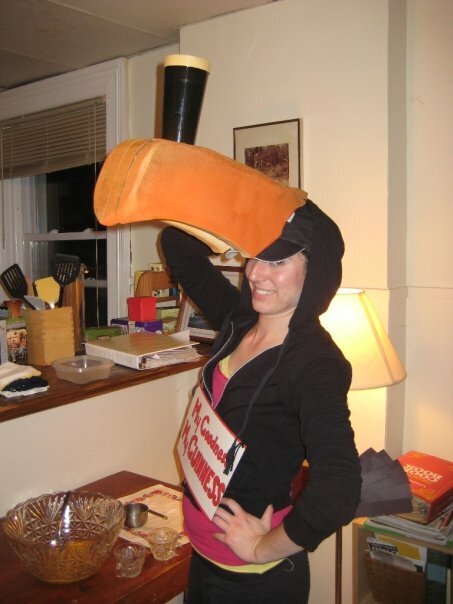 I love Guinness… so much so that I donned a beak and tailfeathers in honor of the stately stout this Halloween. But interesting facts that fall by the wayside when people discuss this dark draft: it has less calories than many light beers, less alcohol than its fellow brews, and, as it turns out, fits snugly in line with the current antioxidant craze. Is Guinness Really Good for You? There is some good health-related news on the Irish front: You know those charming old Guinness beer ads that proclaim it to be good for you? Turns out, they might be right—though not for the reasons originally thought. I’ve had my share of homebrew intrigue, but a severe lack of storage (let alone prep) space has held me back. Thank you Brooklyn Brew Shop for providing a solution for all us apartment-dwelling wannabe beeristas. Stephen Valand and Erica Shea started the Brooklyn Brew Shop earlier this year, selling gallon brewing kits sized for New York apartments. I don’t drink much water. I should, but I don’t. Good thing beer is about 90% water, right? And good thing these Portland, Oregon, brewers took control of their water! Portland brewers rally to save their craft’s most sacred resource. If Jesus had been a Portlander, he might well have chosen to turn water into beer. After all, a big reason Stumptown is the nation’s Holy Land for microbrewing stems from our superior water, courtesy of the Bull Run watershed.